Archimedes Principle and the standard textbook density of helium (corrected for current temperature & pressure) are used along with the experimentally determined mass and volume of a helium filled balloon to calculate the density of air. String should be roughly one arm's length (~1m) long. Also, please use the cheapest common white string. Balloons must be at least 12 inch diameter type. Fish Tank should be placed on stainless steel cart (says "LAKESIDE" on the handle). Do not put water in the tank. Leave it dry for instructor to fill as desired. 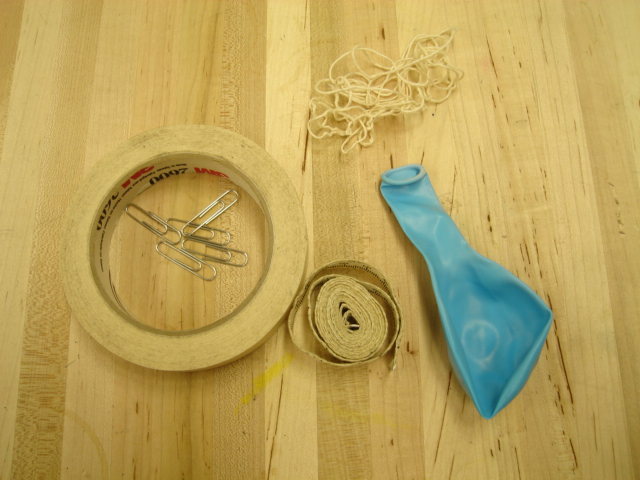 The balloons and strings are often thrown out by students, so put the box of balloons, large spool of white string, and a pair of scissors out on the instructor's table. Additionally, ensure that the one spring scale for the room is 20 N (not 50) and is labeled in Newtons and not Hectograms. Item modified on 2015-06-01 13:57:01 by andersone1.